I have always been personally curious about the lack of documented evidence for a tsunami ever occuring on my home coast of North Carolina. Some of the largest undersea land slides on earth have been documented off our wonderful Outer Banks, and earthquakes are not completely unknown in the Carolinas. Both cause big waves. But more to the point for the Tusk, some very credible work has documented cosmically-induced tsunami in the New York and Hudson Valley region, not far away from NC in a regional sense. Why then is there not some sign of a big wave ever — just once — running up onto the flat and featureless Carolina coast in human times? After re-reading some of the work of Dallas Abbott and others describing tsunami signatures in Long Island Sound and the Hudson Valley, I was googling about for anything else hinting at such a wave. I had looked before — but apparently prior to the 2007 publication of the article below. We document here the threat of large scale destruction (collapse) of barrier islands based on the study of many cores taken along the Outer Banks and in Pamlico Sound, North Carolina.Around 1,100 cal yr BP, probably as the result of hurricane activity, portions of the southern Outer Banks must have collapsed to allow normal salinity waters to bathe southern Pamlico Sound for several hundred years. Such collapse could occur again during our current regime of global warming, rising sea level and increased tropical cyclone activity. The economic effect of barrier island break collapse on Outer Banks communities would be devastating. 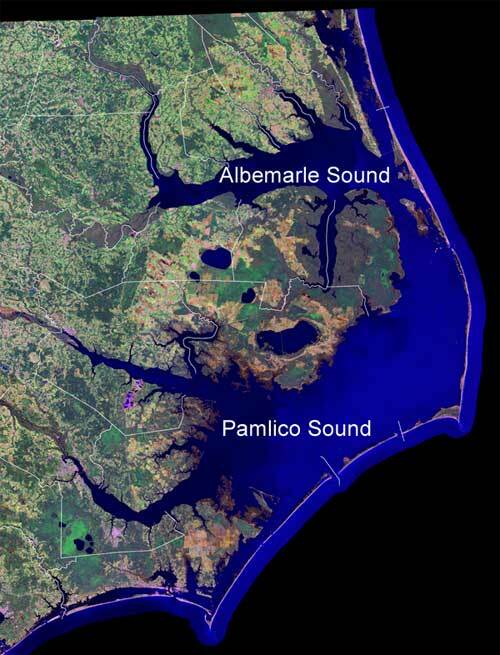 The authors describe a catastrophic inundation around 1000 AD of the Pamlico Sound, the 2000 square mile shallow estuary that defines North Carolina’s coast. Look closely at the seaboard of our proud state. The coast is characterized by long narrow barrier islands that embay the Pamlico Sound, an inland sea, as thought by Verrazano. I knew work had been underway for years taking geological cores from under these Sounds, led by Stanley Riggs of ECU and the USGS. But I had not seen much of interest to the Tusk (though I have not paid terribly close attention). In any case, the cores in the Pamlico Sound revealed that the sound had been repeatedly — at least twice in the last 5000 years — inundated by seawater. Flooded so throughly by the sea that the former sound became open marine waters for hundreds of year before closing again. The authors presume it was a hurricane or closely space hurricanes that caused the Pamlico Sound to become the sea again for 500 years. The Tusk thinks the authors are probably underestimating the potential for a cosmic tsunami. 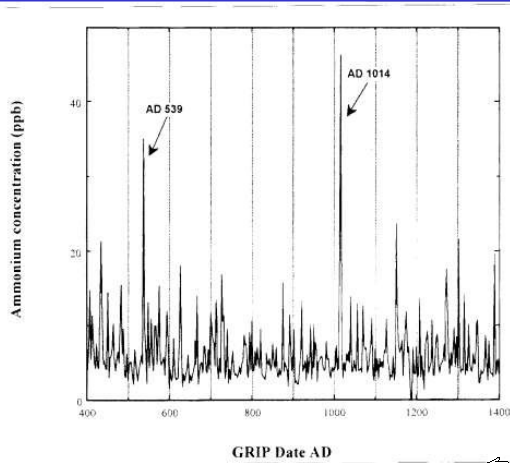 Abbott, an earth scientist as well, found evidence of Holocene tsunami’s on the eastern seaboard and concluded they were induced by rocks into the pond. The authors kind of leave you hanging after the tsunami reference, huh? Culver, et al. don’t rule out a tsunami, but rather claim their manner of testing for abundance and types of tiny sea creatures called “foraminifera” cannot — yet — define a tsunami. Fair enough, but it still leaves me wanting them to rule tsunami out on other grounds — which they do not. Then things get more interesting — much more interesting. Looking for references to an Atlantic tsunami in 1000 AD, I remembered another Dallas Abbott paper, one which I posted last year to the Tusk. In the paper Abbott tentatively dates tsunami materials from a New York bog to several time periods. And she puts the most recent tsunami layer in New York within the same period as the Pamlico inundation. Further corroboration is found in the well-recorded English annals from September 28, 1014, where middle age historians note a “flood from the sea” in England. [The congruence of Abbott’s findings and the English tsunami history is well summarized in this 2012 blog]. On 28th September 1014 widespread coastal flooding occurred in Britain . William of Malmesbury in The History of the English Kings (vol. 1) states that «a tidal wave, of the sort which the Greeks call euripus and we ledo, grew to an astonishing size such as the memory of man cannot parallel, so as to submerge villages many miles inland and overwhelm and drown their inhabitants..
For the same year, the Anglo-Saxon Chronicle states that «on the eve of St. Michael’s Day [28th September], came the great sea-flood, which spread wide over this land, and ran so far up as it never did before, overwhelming many towns, and an innumerable multitude of people» . Some accounts suggest that this flood affected Kent, Sussex, Hampshire , and even as far west as Mount’s Bay in Cornwall, where the Bay was «inundated by a ‘mickle seaflood’ when many towns and people were drowned» . Healy  describes organic deposits in Marazion Marsh, that lie behind a coastal barrier in Mount’s Bay, that is dated to no later than AD 980 and overlain by a sand layer, which could be a signature of the flood event. In North Wales, it has been suggested that recently described field evidence for tsunami impact may be related to this Celtic event . The flood is also mentioned in the Chronicle of Quedlinburg Abbey (Saxony), where it states many people died as a result of the flood in The Netherlands, and it is remembered in a North American account by .